Given the prime location of Arup’s new Liverpool office, we treated the 10,500 sq ft space as a blank canvas to reflect the area’s dynamic industrial and artistic mix. The result? A fit out steeped in local history, with staff wellbeing at its heart. 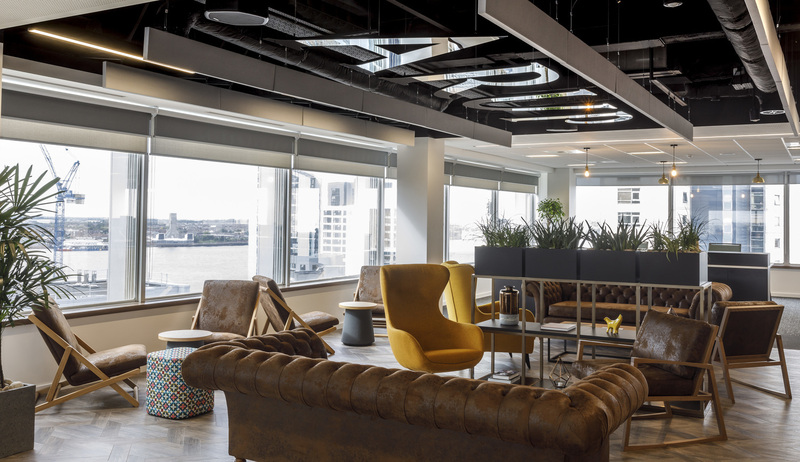 With ambitious expansion plans, Arup needed a fit out that embraced modern ways of working, while also being flexible enough to grow with future expansion. 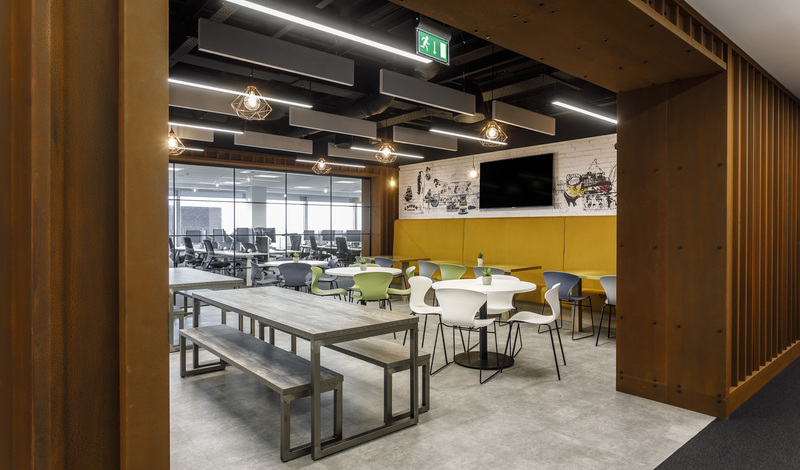 Arup’s focus on staff wellbeing goes beyond agile working and sit/stand desks, as we made sure staff wellbeing was instilled into the space’s industrial aesthetic. This starts the moment you enter, as you’re directed around to the lounge area via petrified moss arrows. 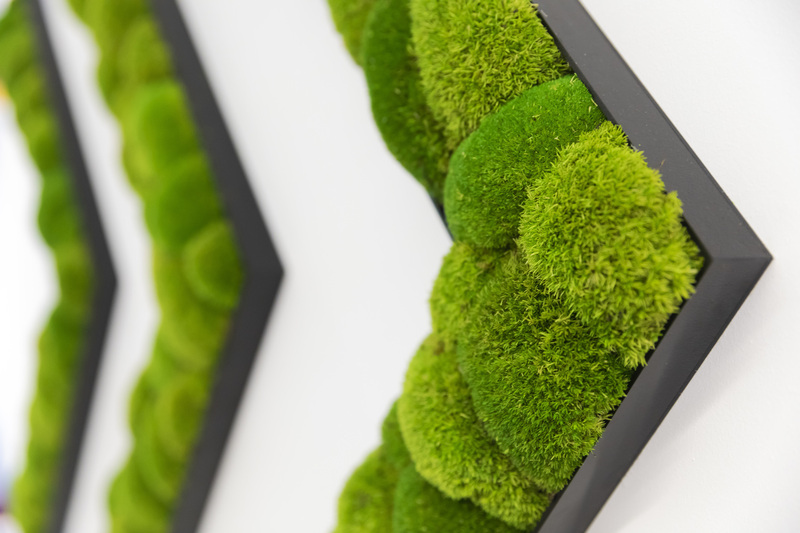 Biophilia was made a priority throughout the design, not only by using indoor plants, but also through the choice of furniture. 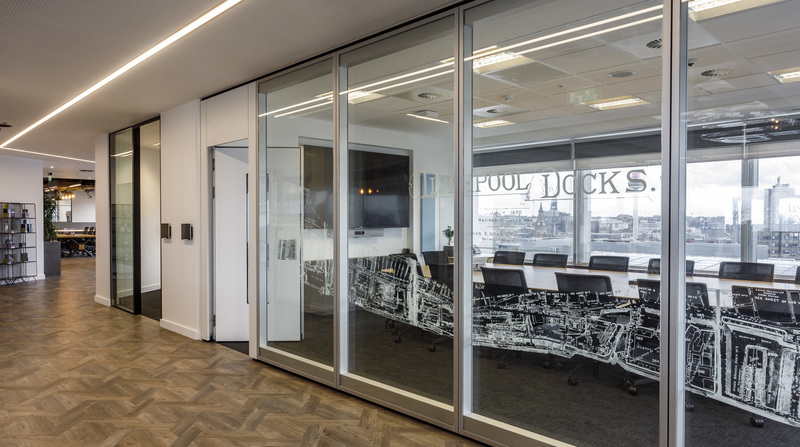 We’ve used a natural, smoky timber finish on custom joinery, sourced an oversized timber boardroom table, and used natural oak parquet flooring throughout high-traffic areas. The soft furnishings also reflect the natural environment, with rustic leather sofas, and chairs finished off in a sunshine yellow; giving each space a distinct feel that’s linked with the natural environment. This bespoke reception desk was designed to resemble a ship emerging from Liverpool’s Royal Albert Dock; a look that’s completed with galvanised steel and hex bolts. This starts the theme of paying homage to the local area’s heritage, with everything from recovered blueprints to local modern street art. 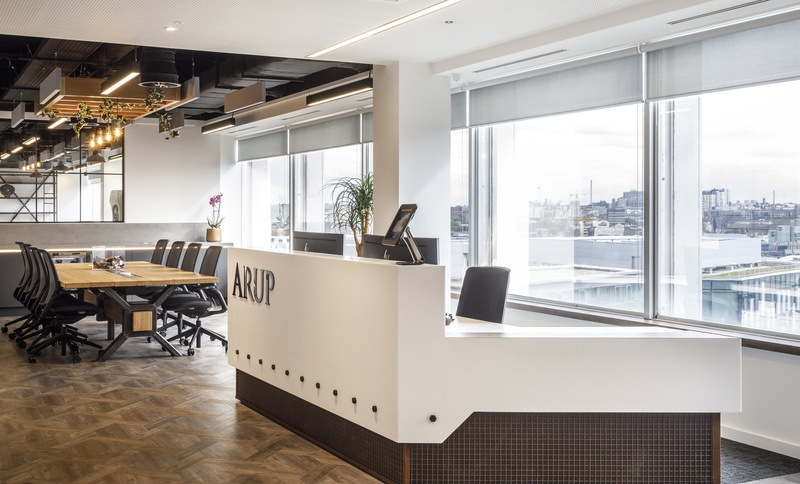 Arup want their clients to feel welcome in their space, so we created a suite adjoining the reception, where guests can work before or after their meetings with Arup. Complete with a tea point, it’s a space that allows their visitors to work and focus in private. This eclectic open plan breakout space acts as the heart of Arup’s agile office community. Designed to foster chance encounters and collaboration, the dynamic space features an array of furniture; from deep comfy sofas to high-backed solo chairs and relaxed deck chairs, providing an option for everything from 1:1 catch-ups to team meetings. The adjacent hub features bleacher seating to one end and glazed folding walls, allowing for it to open up and transform the lounge into a dynamic hospitality suite - perfect for training and client workshops. You’d be forgiven for thinking the walls were a bit rusty on this side of the office. This centrally positioned breakout space was designed to mimic a shipping container, further reflecting Liverpool’s maritime history. Featuring bench and café-style seating, and media screens, this is a multi functional space that can transform from a funky staff kitchen into an event space in moments. Arup wanted to take the theme of agile and collaborative working and apply it to the whole office, not just the client-facing areas. We didn’t want to create a jarring atmosphere when staff go from an engaging meeting space back to a bland desk. That’s why we sourced these workstations, which essentially look like oversized dining tables, and help to reinforce a sense of communal collaboration. To ensure staff still have adequate space and privacy, storage dividers are situated between each row of desks, and are finished off with indoor plants. Interspersed amongst the workstations, touchdown desks provide space for collaboration when a quick meeting is needed, so colleagues can move away from their desk and avoid disturbing neighbouring colleagues.